I was strong this Thanksgiving — and Fido survived. No handouts from the table. No cripsy bits of fatty skin in the kitchen. No gravy on his kibble. Fido and I are sharing our post-Thanksgiving tradition: Delighted Dog Turkey Stew. 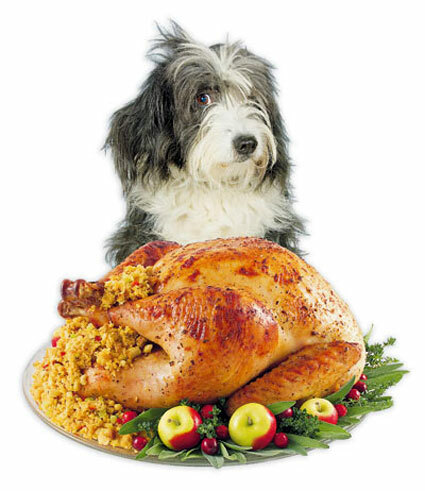 This is the safest, healthiest way to share Thanksgiving bounty with your dog. Take all of the turkey remains and put them in a big stock pot. Cover with water and set to simmer. If you really want to make life easy for yourself, tie the turkey remains in cheesecloth. Then when it’s time to take the bones out, they lift out of the pot in an easy bundle. Add no spices — no salt, no pepper, no herbs and ABSOLUTELY no onions or garlic. Simmer for at least two or three hours. If I’m going to be home, I’ll leave it on the back of the stove overnight on the lowest setting. Cooking the bones in a crockpot is another option. When it has finished cooking and the meat is falling off the bones, scoop the bones, skin and other debris from the liquid. You can do this with a slotted spoon, or you can scoop it with a measuring cup into a strainer set over another big pot. If you used the cheesecloth, you can just lift it out (take care not to burn yourself) and set the bagged bones to drain in a large mixing bowl or pot. When the bones and meat scraps are cool enough to handle, you can separate out the bits of meat to add to the stock with vegetables later. Let the stock cool to room temperature. When it’s no longer hot, put the covered pan in the refrigerator for 12 hours or overnight. When the fat has risen to the top of the stock and turned solid, remove it and throw it away. What you are left with is a bland, calcium-rich stock. I warm it up again and strain it just to be sure that all the bits of bones are out of the stock. Put the strained stock back in the pot, heat it to a simmer. Add diced carrots, sliced celery, chopped up broccoli, chopped spinach or kale and diced sweet potatoes. Toss in the meat bits you saved fromt he bones. You can add enough to make the stock thick with vegetables. Cook until soft. Cool to room temperature. At this point, the Delighted Dog Stew is ready to serve. 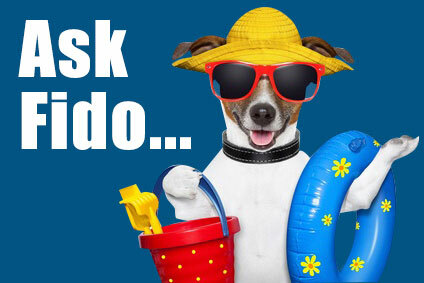 It can be ladled over Fido’s regular dog food for an extra treat. It can be served as a meal (depending on how much meat is in the stew, you may need to add canned dog food or raw ground turkey for more protein). It can be frozen in plastic sandwich bags and then thawed as needed. The beauty of this stew is that it has all the healthy parts of turkey with none of the dangers. 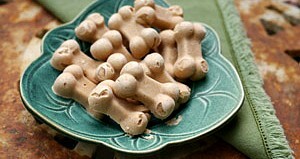 It includes vegetables that are good for a dog’s digestion. Most dogs LOVE the taste. It makes use of food that would otherwise go to waste. And it’s easy. Bon appetit, as the immortal Julia Child would say.